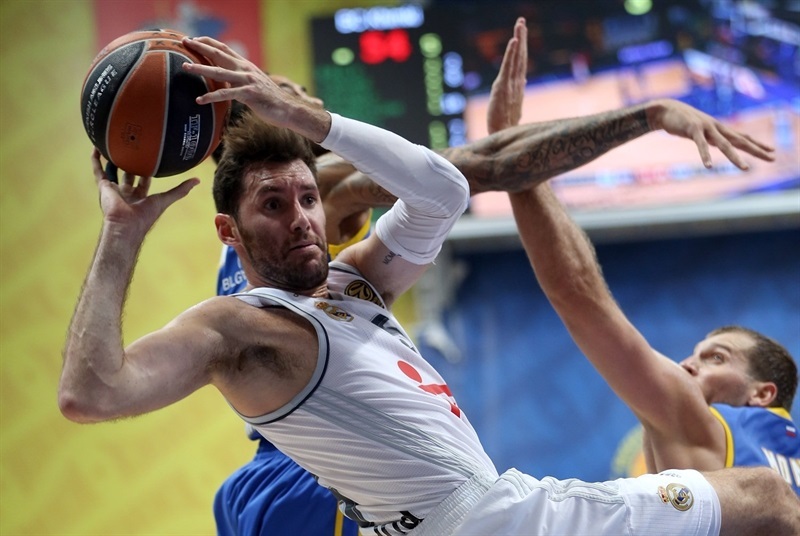 In a battle between the reigning Turkish Airlines Euroleague and the Eurocup champions, Khimki Moscow Region left no doubt about its power and potential by downing Real Madrid 84-70 at home in Group A on Friday. Marko Todorovic led the winners with 15 points and 8 rebounds. 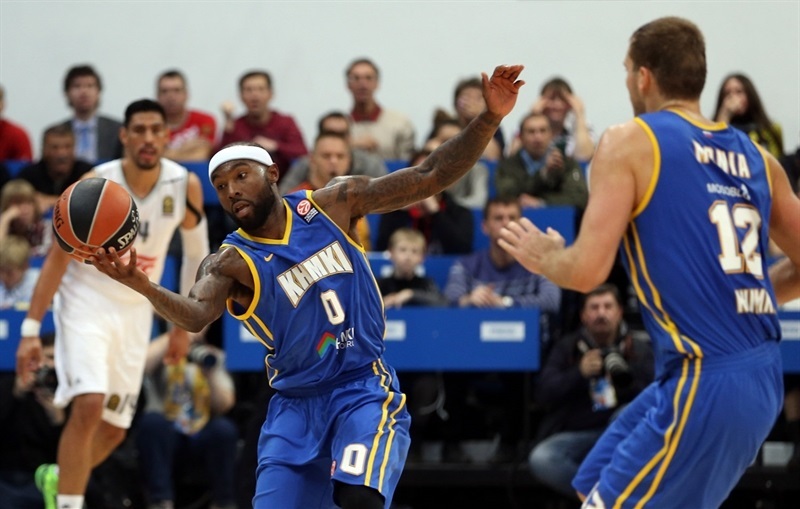 Alexey Shved added 13 points, Tyrese Rice scored 12 while Sergey Monya and James Augustine each got 10 for Khimki. Sergio Llull led Madrid with 20 points. 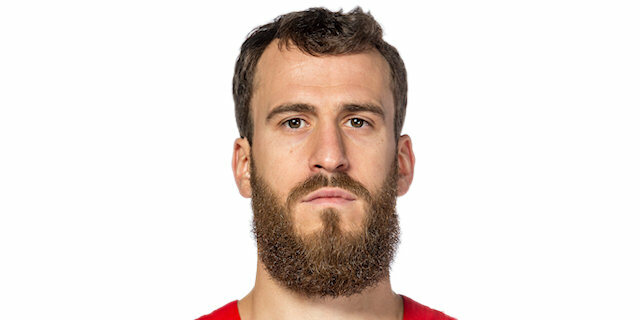 Jonas Maciulis added 10 for Los Blancos. 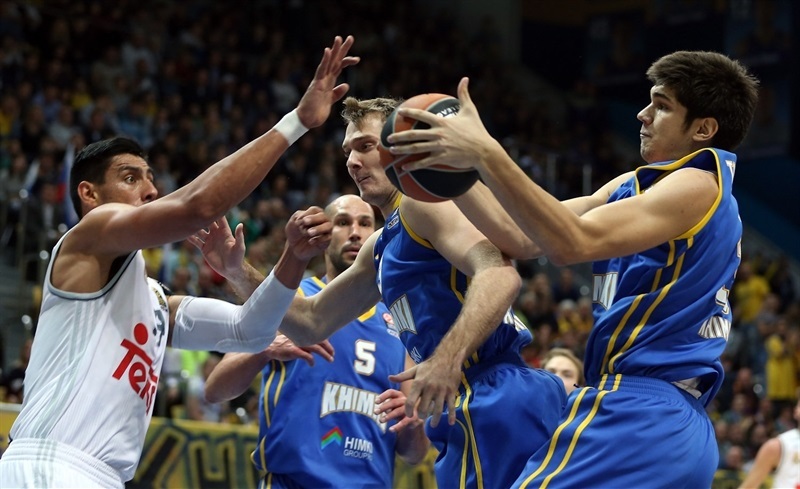 Khimki had a strong start, as a layup by Petteri Koponen gave the hosts a 13-6 lead. 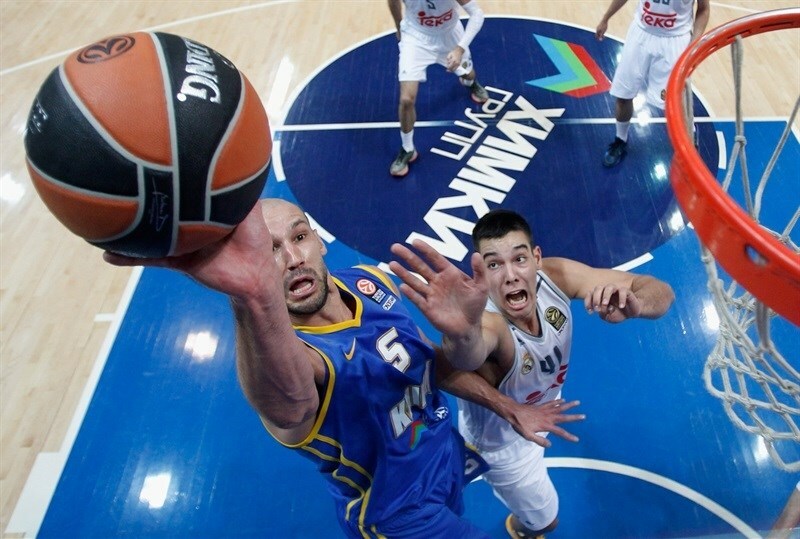 Gustavo Ayon stepped up for Madrid but a buzzer-beating basket by Shved gave Khimki a 21-14 lead after 10 minutes. Shved, Todorovic and Augustine, who had all of his points and rebounds before the break, helped Khimki to a double-digit lead, 43-32, at halftime. Rice shined after the break to boost his team's margin to 59-43 midway through the third quarter. Nothing changed after that as Khimki boosted its margin to 75-58 and never looked back. Both teams struggled to score early until Monya struck from downtown. Tyler Honeycutt hit a three-pointer from the right wing, as Madrid was held scoreless for almost three minutes. Rudy Fernandez rescued Los Blancos with a triple, but Egor Vyaltsev also hit one from beyond the arc for a 9-3 Khimki lead. 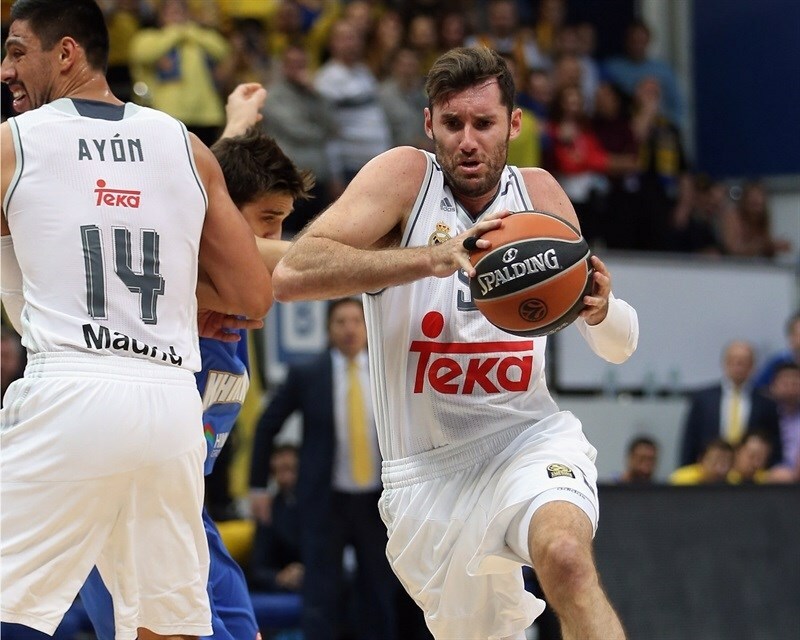 Llull buried a corner three-pointer, which James Augustine followed with a put-back basket for an 11-6 score. 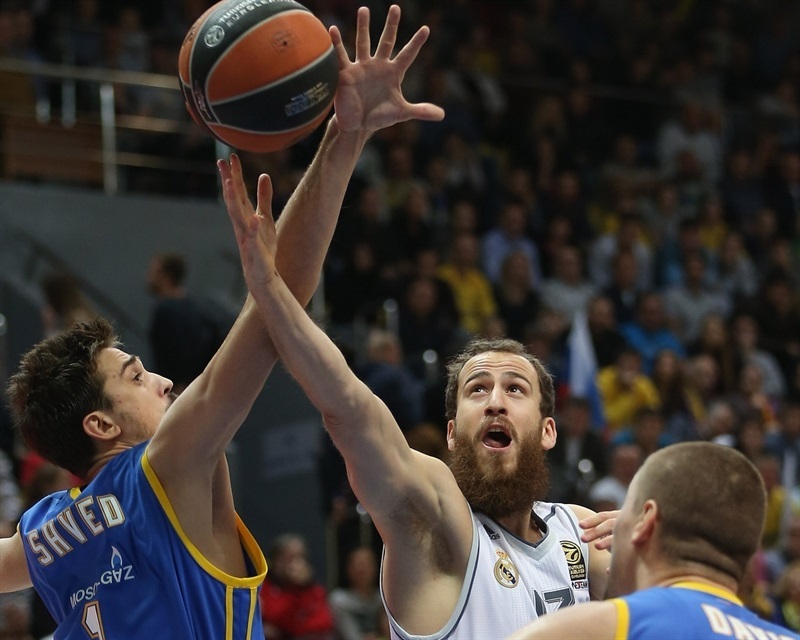 Petteri Koponen shined with a wild driving basket, as Madrid tried to circulate the ball better with Sergio Rodriguez on court. Fernandez hit an off-balance shot, which Ayon followed with a turnaround jumper that made it 13-10. Marko Todorovic stepped up with a backdoor layup and James Augustine erased Ayon's up-and-under layup with a put-back basket. Todorovic and Fernandez traded layups and a wild buzzer-beating basket by Shved boosted the hosts' lead to 21-14 after 10 minutes. Paul Davis nailed his trademark turnaround jumper early in the quarter, but Rodriguez found Willy Hernangomez for an off-balance basket. Todorovic took over with a tip-in and a free throw by Shved soon made it a double-digit game, 26-16. 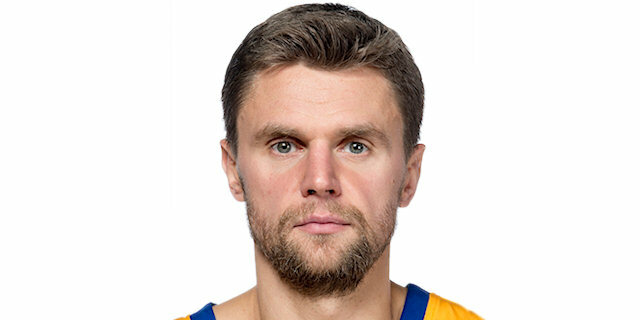 Luka Doncic - making his Euroleague debut at age 16 - made free throws before a left-handed layup by an unstoppable Todorovic restored a 28-18 Khimki lead. Hernangomez scored again, but Shved banked in a fallaway shot in transition. Hernangomez blocked Shved’s next shot and split free throws at the other end for a 30-21 Madrid deficit. After Augustine scored around the basket, Llull and Shved exchanged three-pointers and an off-balance shot by Rodriguez kept the guests within 35-26. Augustine kept pushing the hosts with another layup, which Monya followed with a driving basket for a 39-26 Khimki lead. After Hernangomez hit a jumper, Koponen and Jaycee Carroll exchanged one-handed floaters and Augustine scored again to keep Khimki way ahead, 43-32, at halftime. Jonas Maciulis hit free throws immediately after the break and soon added a three-pointer that forced Khimki to call timeout at 43-37. Monya rescued the hosts with his second triple and Vyaltsev also struck from downtown to keep Khimki out of trouble, 49-37. Ayon split free throws and a floating layup by Rice - his first points - made it a 13-point game, 51-38. Felipe Reyes made foul shots, but Koponen did better with a big three-pointer off the dribble. Maciulis hit another one from beyond the arc. Monya beat the shot clock with a baseline jumper, but a fast break layup by Rice forced Madrid to call timeout at 58-43. Maciulis shined with an off-balance layup, which Rodriguez followed with a turnaround jumper to bring Madrid a bit closer, 59-47. Todorovic and Trey Thompkins made free throws to fix the score at 61-49 after three quarters. Rice split free throws early in the quarter, as Madrid tried to speed up its offense with Rodriguez, Llull and Carroll together on court. Llull picked up a great pass from Thompkins for a layup-plus-foul and soon added free throws to bring Madrid within single digits, 62-54. 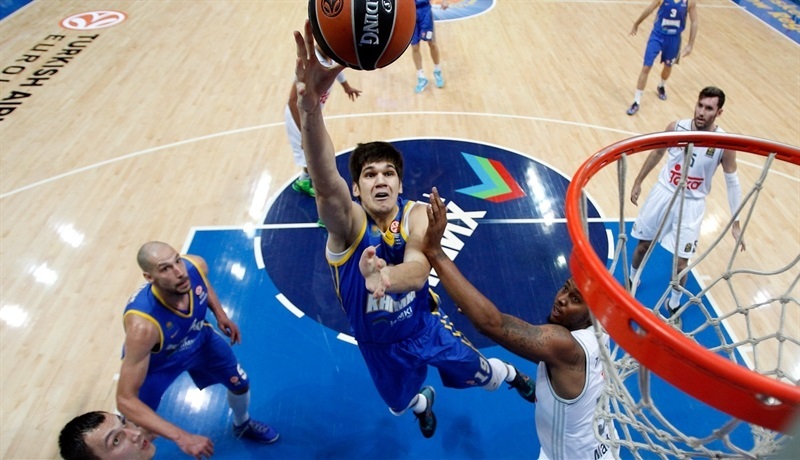 Todorovic split free throws and a jumper by Shved restored a 65-54 Khimki edge. Shved kept pacing the hosts with a three-pointer off a screen that caused Madrid to call timeout at 68-54. Todorovic shined with consecutive put-back layups, but Thompkins and Rodriguez kept the guests within 72-58. A three-pointer by Rice sealed the outcome, 75-58, midway through the fourth quarter. Madrid never gave up, but the Khimki fans in the stands had plenty of time to celebrate a win that none of them will forget for a long time. “For sure I’m happy that we’ve won today because we beat a really strong team, a reigning Euroleague champion. We have a new team that came to the Euroleague this season and it was very important to start from a win. I would like to thank my guys for their effort and energy that they gave on the court. I’m really happy." 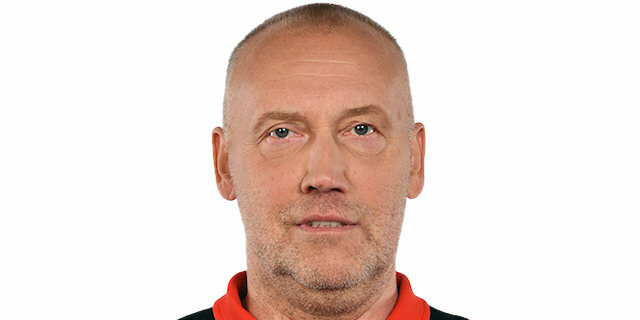 “I congratulate Khimki on this victory. They played very well in the first half. They dominated on the boards in the beginning of the game and were able to take more shots. They had an advantage in the first half. I think we improved in the second half defensively and did better things that was not enough to come back in the game. You see the numbers that very clear show the difference on the offensive rebounds. Khimki had 15 offensive rebounds; that meant 15 more possessions. And also our turnovers. If you permit the other team to get 15 rebounds and you turn the ball over 17 times it’s very difficult to win the game. We just have started the Euroleague and it was our first game. It was a good lesson to learn from the first day."